Building on the Big Island of Hawai’i for the past 30 years, we have steadily improved on the practices started by the earliest settlers to this beautiful island. More and more, using modern building materials, we are building to accommodate a way of life that more closely resembles the relaxed ways of the past. 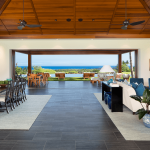 Open lanais, large walls of glass and screen that open into pockets inside exterior walls, inviting the outdoors in, lava stone pavers with grass growing where before there would have been grout… all of these signal a softer approach to living.